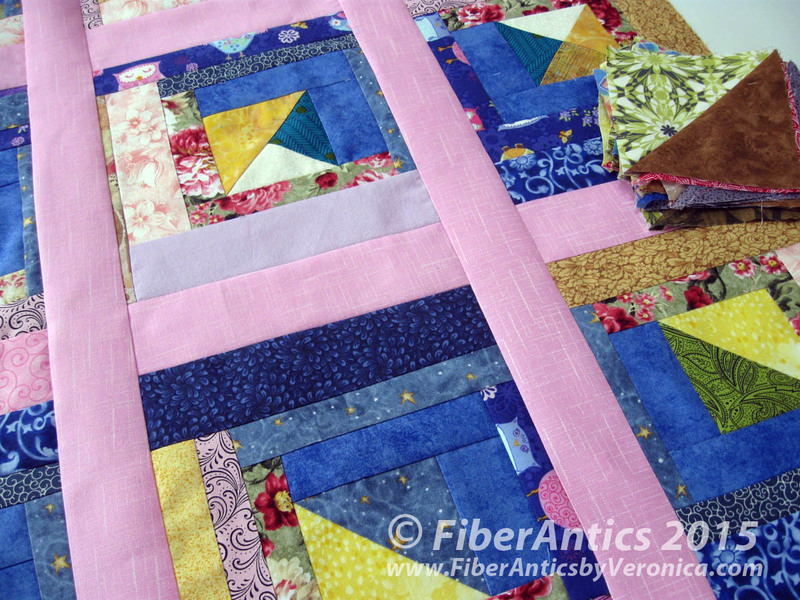 Fiber Antics by Veronica: Wanna "kick the tires" in my next free-motion class? Wanna "kick the tires" in my next free-motion class? for 2 days of Intro to Free-motion Quilting classes in Murfreesboro. I'll be at Absolutely Fun Sewing and Embroidery for two days of teaching and I'm really looking forward to it. Judy, the shop owner, will have 3 sit-down quilting machines set up in the classroom for students to test drive—"kick the tires," so to speak. I mentioned this great opportunity in an earlier post. 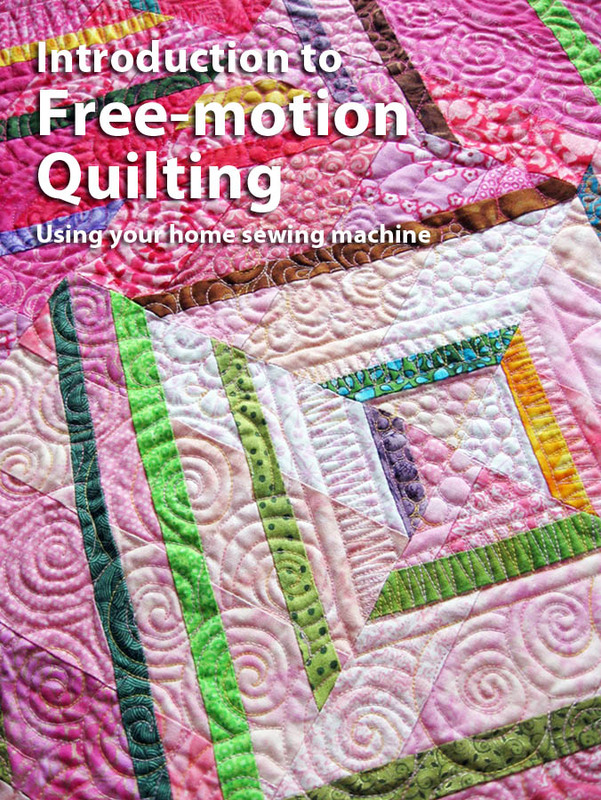 So if you want to do a free-motion quilting "test drive" on a few different sit-down quilting machines, come out to Murfreesboro this Friday or Saturday and join the fun. What I mean by this: I'm bringing a kitty quilt top to to use for a test drive. 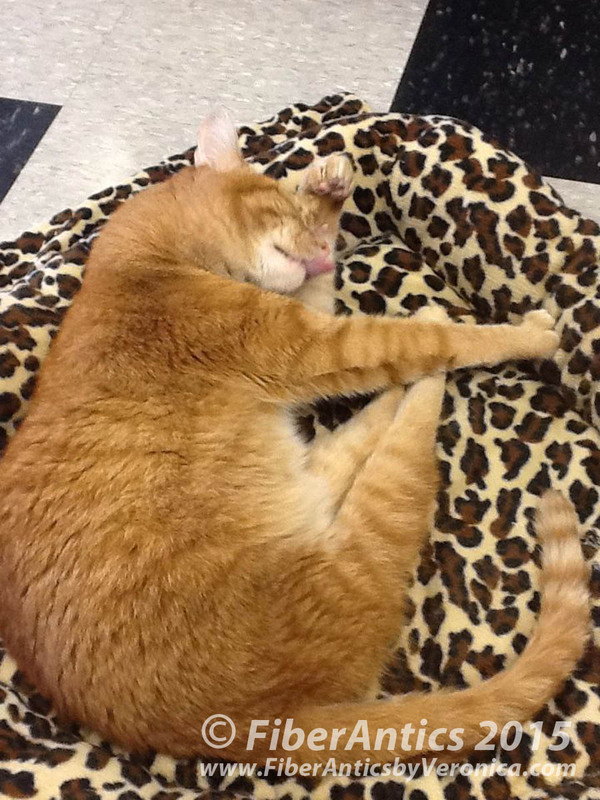 The finished quilt will be for Jesse and his friends at the Cat Clinic. It's a good idea to bring a sample of the type of projects you normally work on when you go to test a sewing machine. I make these little (27" x 29") quilts for the kitties at the clinic. But... they are also good for practicing free-motion quilting, testing out a new design or a new thread, AND "kicking the tires" on a new machine. This particular kitty quilt is made with scraps... in log cabin fashion. There is a half-square triangle unit (or a variation) in the center of each block. The strips and strings have various widths, so the blocks are a bit lopsided… or "catty"wampus? 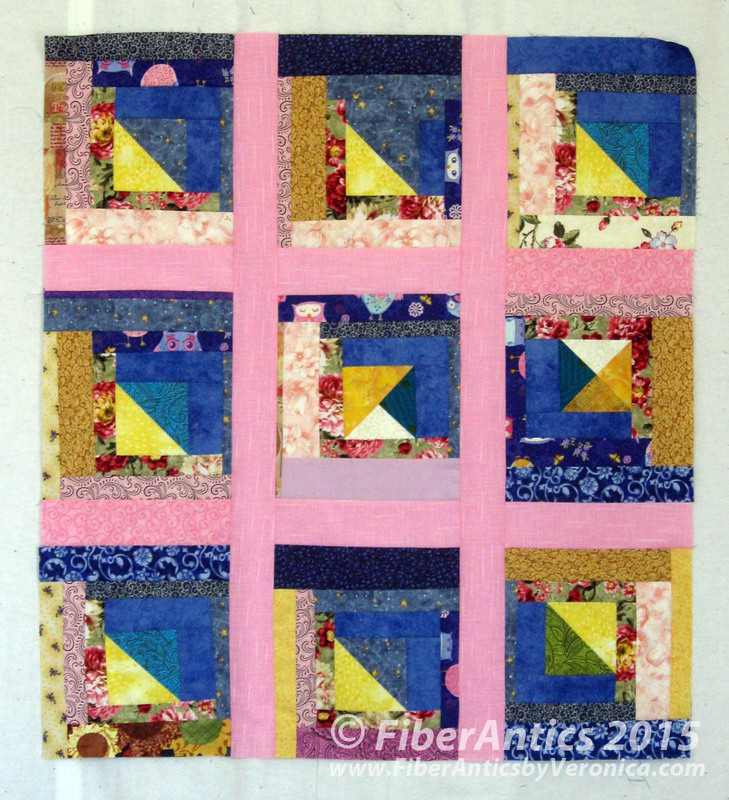 The pink sashing brightened up the color palette a bit and the blocks are not square (8.5" x 9.5" unfinished) to accommodate the format and size of the kitty quilts that fit the crates at the Clinic. Yeah, I have one column with a few blocks upside-down… I didn't notice until it was together. (I shouldda had it up on the design wall.) I may change it… or not. I don't think the kitties will care, do you? I stopped in last Saturday to drop off a finished kitty quilt. 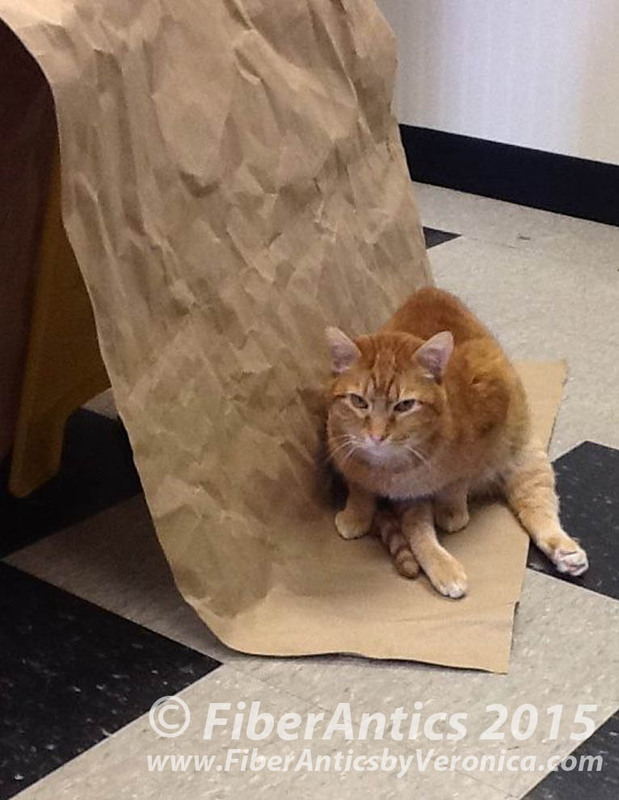 Jesse the Wonder Cat was there—in all his cuteness—bopping around in the reception area—his kingdom, no doubt. 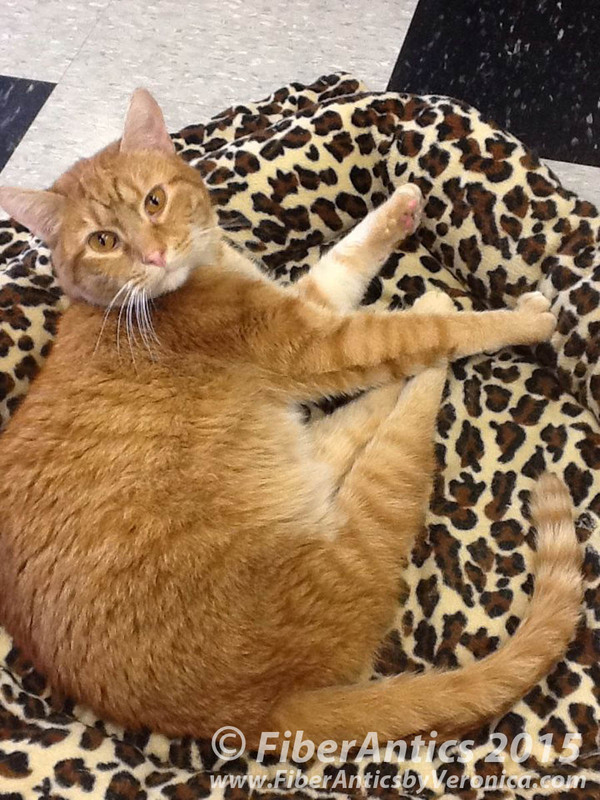 Jesse the Wonder Cat at the Chattanooga Cat Clinic. Here he is beside his paper tent. Pretty cool tent, huh? Jesse and his paper tent. As I was ready to go, he got into the kitty bed and decided to take a little rest. Being a Wonder Cat is a tough job, you know. Maybe a little snooze time is in order. I'll sandwich and pin baste the kitty quilt to take to my Intro to Free-motion Quilting class for the test drive. If you're in Murfreesboro this Friday or Saturday [March 27-28] and want to join me for class—or to test drive a machine—contact Judy at Absolutely Fun Sewing and Embroidery, (615) 295-2998. Tell her Jesse the Wonder Cat sent you.